Photograph collection of webmaster. Thornaby based D5153 is seen very early in its career, little changed from the day it was outshopped from Darlington Works. The location is not known but maybe in the York area. The fifteen year three month career of D5153/25003 included allocations to Eastern, London Midland & Scottish Region depots. Withdrawn August 18th 1976 (collision damage to No.1 cab, 2nd man's side). 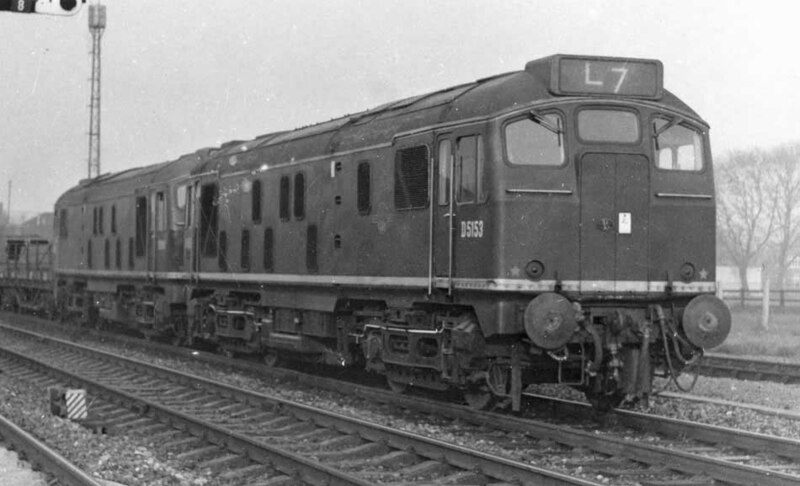 25003 was the 10th Class 25 withdrawn, one of two retired during August 1976. After withdrawal 25003 was moved to Glasgow Works by early October 1976 and scrapped there by January 1978. Noted Derby Works April & May 1966 (ex-works repaint). Nored Derby Works October 1975 (classified repair, full repaint). On an unknown date D5153 (in green livery, with small yellow warning panels) was noted lying on its side at Hesleden Bank (Hartlepool), presumably having run through catchpoints? It presumably required a Works visit to rectify the damage sustained to its side. The only recorded passenger working so far known took place on June 17th 1972 with 5153 & 7646 working the 08.58 Derby - St. Pancras throughout. An odd combination noted working the 6M70 18.50 Millerhill - Carlisle freight was 5153 leading 1534 on April 10th. In the early hours of May 26th 5153 was noted at Motherwell depot in plain green with full yellow cabfronts. Condition May: gangwaydoors present, circular guage present on side of fuel tank. 25003 was noted at Millerhill depot on November 8th, in company with 24106 & 24113. July 26th, 25003 & 25025 were stabled at Ayr depot. 25003 was withdrawn on August 18th 1976. Page added August 10th 2013. Last updated January 22nd 2019.